Austin Goins, a standout on the Rhea County High School Fishing Team, lands a scholarship with hometown Bryan College to join the defending National Champs, the Bryan Anglers. “I couldn’t have passed on a better candidate to fish in college,” says long-time bass fishing coach Brian Derlak. Austin has been fishing competitively under the tutelage of Derlak since 7th grade, parents and Andy and Christina Goins says he’s been fishing since he was three. His father notes, there’s something special about high school bass fishing for parents. As the boat captain, you’re actually on the playing field. While boat captains don’t fish, it’s their job to put their team on the fish. “It’s like if your son is the quarterback, you’re getting to center the ball to him,” Andy adds. In addition to joining the #1 Bass Fishing School in the nation, Austin says going to hometown Bryan has other perks as well. “I can go to school and live at home. But the main thing is they are so good,” admits Austin. It’s more than just fishing on the lake. This whole thing is possible through what he’s done in the classroom,” Derlak stresses. And Austin has certainly made the grade. He holds a 3.65 GPA and plans to pursue a degree at Bryan College’s new Vogel School of Engineering. 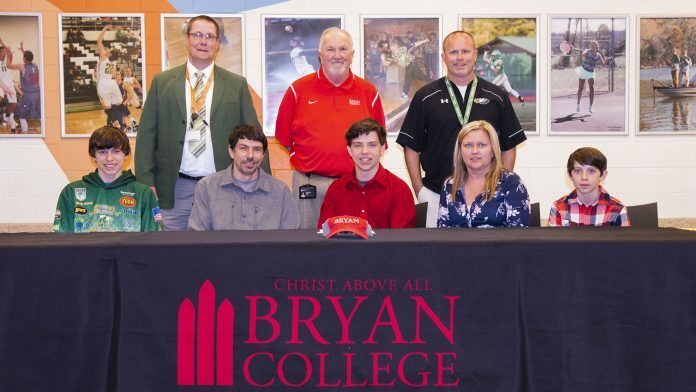 “I’m so glad he’s met all his requirements and will go on to fish with Bryan College the defending National Champs,” adds an even more than usually elated Derlak. 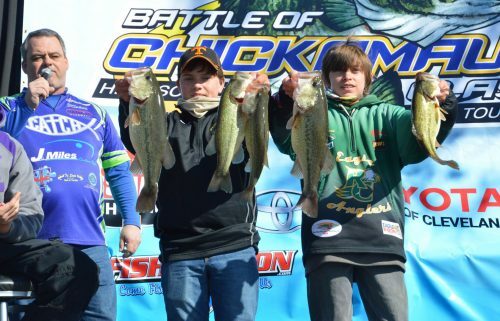 Goins hopes to cap his already stellar high school fishing career with a win at the 2018 Tow Boat US Battle of Chickamauga Classic to be held in Dayton on April 28. Between 250-300 teams are expected to enter the tournament. Goins says he’ll probably fish shallow but will have to analyze conditions as the tournament nears. He’ll be fishing with brother Bryar Goins with whom he’s had great success. His dad, Andy, says he’s preparing for the event as well. He’s already taken off work for the whole week. For Austin, the future is bright. With any luck, he and his upcoming Bryan Angler teammates will earn another National Championship ring.